Summer is the best season. After months of gloom and cold, wet weather, the sun is shinning and stays out until late evening. The TV is willingly abandoned and the kids are playing in the garden or on their bikes in the street. It’s lovely. It reminds me of my childhood playing outside with my neighbours as we are all more all less the same age. It’s great that my children can have that as well. If I let them, they will be outside until bedtime. Summer is also the season for smoothies and salads as when the temperatures are getting warmer, it’s no time to spend your day cooking on the stove. Though from time to time, even when it’s hot, my need for baking and muffins is too strong to ignore and I have to brave the heat of the sun and my oven. It’s all worth it in the end and to be fair, it rarely gets so hot here that it would be unbearable. Mornings are always good for baking. But at the moment, it’s all about salads here. I got myself a julienne peeler several months ago and never used it until recently as I did not fancy raw noodles in the midst of the winter. So I finally got round to use it and made courgette and carrot noodles for this salad. Not only it’s extremely easy to make veggie noodles (I feared that it would be fiddly) with a julienne peeler but they look so good and make any salads look instantly pretty. It’s also a great way to up your intake of raw veggies as they are somehow ever more tasty as noodles! If you want to keep this salad raw, just omit the glass noodles. It tastes good either way. The dressing for this recipe is adapted from the Detox health plan cookbook from Maggie Pannell. 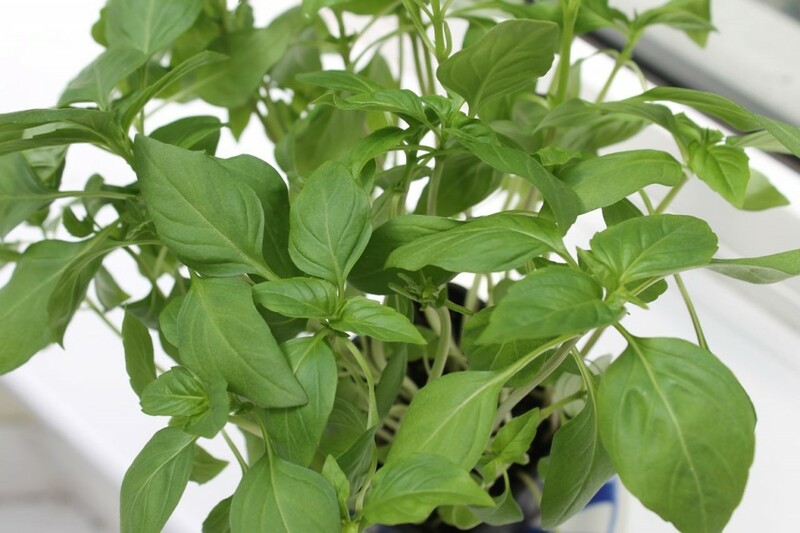 The combination of the mint and thai basil give it a fragrant and refreshing note. Combine the coconut milk (shake the can well before use), add the soy sauce, the minced garlic, ginger, chilli, basil, mint and a splash of sesame oil. Mix well and set aside while you prepare the vegetable noodles. In a bowl, pour some boiling water over the glass noodles and leave to stand for 5 minutes while you are preparing the vegetables. 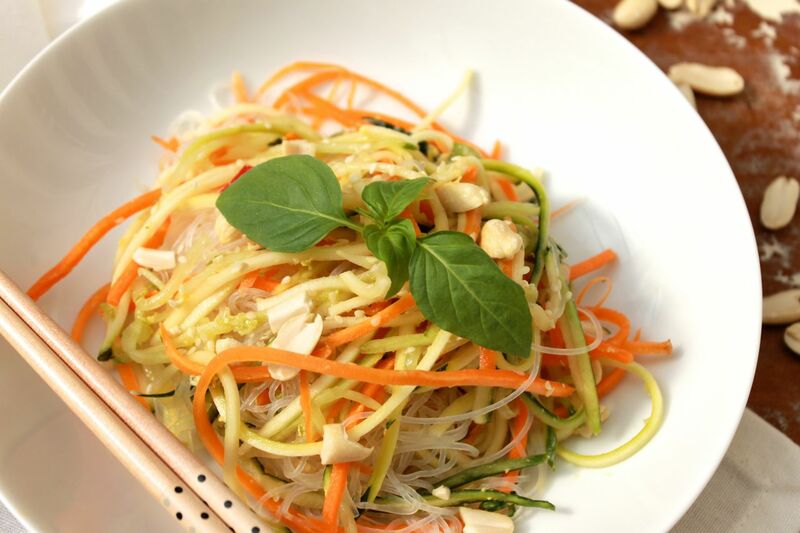 Use a julienne peeler to make the courgette, carrot and cucumber noodles. If you do not have a julienne peeler, you can chop the vegetables finely into thin batons instead. When the glass noodles are soft, give them a quick rinse under cold water and mix with the veggies. 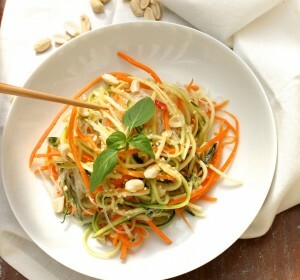 Pour the dressing over the noodles and top with the peanuts, sesame seeds and some extra fresh mint and basil.